Mr. Sushil Handa takes special interest in addressing students at various platforms. 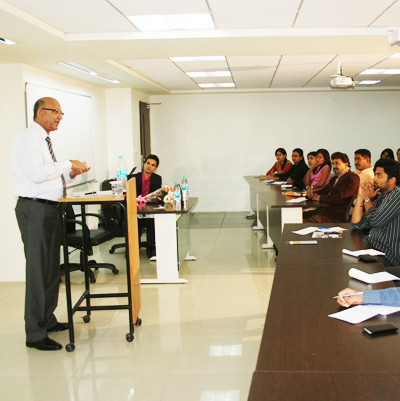 12th December – 2009 : A talk on 'Entrepreneurship' organized by GCCI-Youth Wing. • 14th December - 2009 : Invited to inaugurate the first session of the quarterly Yi-MICA Lecture Series "SPARK" at Mudra Institute of Communication, Ahmedabad. • 16th January - 2010 : Guest of honor for the “Awareness Program on industrial design registration and protection”, organized by the National Institute of Design (NID) and Government of India. • 28th February – 2010 : Addressed students of Entrepreneurship Development Institute (EDI) on 'Garnering above normal profits' as part of Utkranti -Entrepreneurship Development Workshop. • 4th March, 2010 : Addressed students on 'Opportunities, Aspirations & Expectations, Explorations' as Guest lecturer for the 'CEO Lecture Series' at UnitedWorld Business School, Ahmedabad.